Remember bottled meat? Well, here’s another fantastic way to put it to use in a delicious, filling meal that goes together in minutes and can all be stored on the shelf! Doesn’t get much better than that. 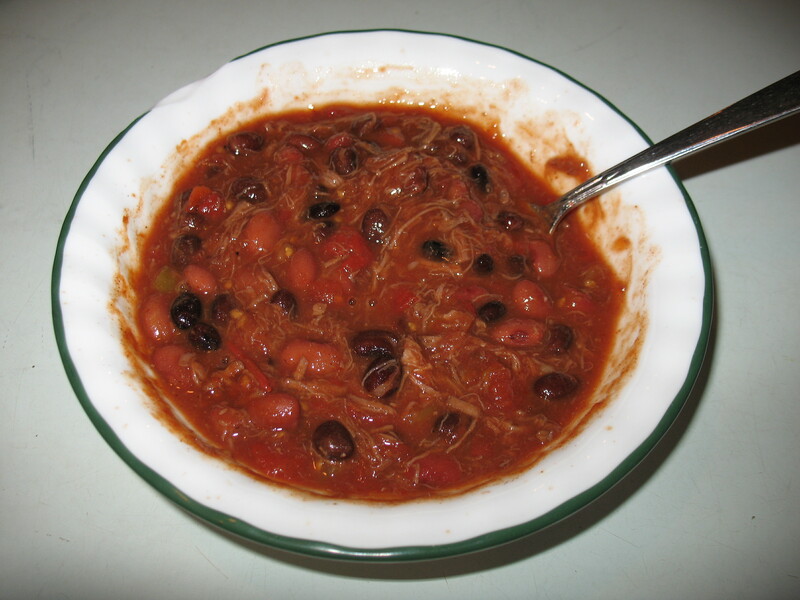 One of my favorite bottled meat recipes: Bottled meat chili. salt, pepper, onion powder (or fresh or dried onions), garlic powder (or minced clove of garlic) to taste. And don’t drain any of the cans–put the beans and meat in the pot with their juice. Heat and serve. If you put in fresh onions and/or peppers you’ll want to cook it long enough to make them tender, and if you used dehydrated onions or peppers cook long enough to rehydrate them–usually 15-20 minutes is sufficient. This chili is not hot, you can spice it up as you desire. And it makes a family size pot, but if you’re having company over, you’ll want to double this recipe. You’re welcome to cook this all day in a crock pot to let the flavors mix, or serve it right out of the pot after it’s all thrown together. If you’ve got a little extra time, fix up some cornbread or cornbread muffins to go with it. I use dried kidney beans and rehydrate them and make a big pot (canner) full of my favorite chili with meat and use my garden tomatoes, onions, peppers, etc. and then can the chilli. Nothing better than opening a jar, heat and eat! I have done the same for vegetable beef soup and spahgetti with meat! when I bottle meat can I add garlic cloves and peppercorns for more flavor. Yes, you can add garlic and peppercorns. That sounds yummy!